The iPhone is the most popular camera in the world. 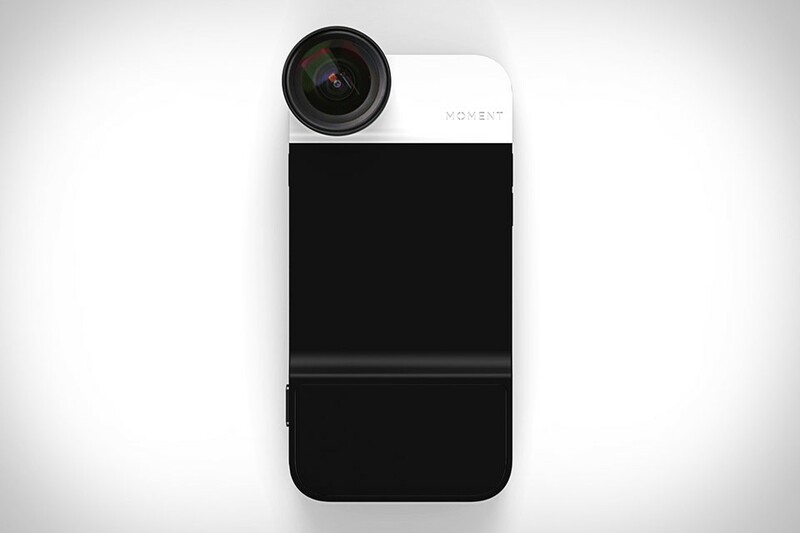 Make it better with the Moment iPhone Case. Beyond just protecting your phone, this iPhone 6 case features a multi-state shutter button that works with a companion app to offer DSLR-like half-press focus and exposure lock. It also features a tapered, rubberized grip, and a reinforced aluminum bar for attaching a camera strap, connects via Bluetooth LE, and offers compatibility with the company's high-quality, distortion-free glass lenses. The case even knows when you've attached a lens, so the app can offer extra features specific to the glass. Your iPhone is great communications tool — but it's mostly only useful if the screen is on, meaning that you're drawing battery power like crazy even if all you're doing is checking and re-checking a list. The PopSlate Case aims to fix this by adding a four-inch ePaper display to the back of your phone. Syncing with a companion app over Bluetooth, its monochrome screen uses little to no battery power, making it ideal for displaying maps, to-do lists, speaking notes, recipes, electronic boarding passes, and other items that don't need interaction to be useful, saving you valuable battery life while making your phone that much more useful. Using a Sawzall with gloves on is easy. Using an iPad with gloves on the jobsite is not. Unless you have the Milwaukee Inkzall Stylus Marker. Designed to let workers use their iPads, phones, and other touchscreen devices while keeping their gloves on, it features a soft stylus tip, a clog-resistant, fine-point permanent marker with a quick dry time, and an integrated hard hat clip that allows you to keep it handy for instant access when and where you need it. Pro photographers know that as great as the auto settings on modern cameras can be, nothing beats shooting with a real light meter. Now you can carry one with you everywhere with the Lumu Light Meter. This pint-sized gadget fits into the headphone jack of your iPhone, and uses a state-of-the-art digital light sensor to give you accurate exposure parameters whether you're shooting still photos, video, or even experimenting with a pinhole camera. Get the tactile joy of real-life foosball and all the benefits of a digital scorekeeper with the iPad Foosball Table. This tabletop game hooks to your older iPad via 30-pin connector, letting the four spinners on each side accurately control the digital players on the field. Other features include sliding colored markers on either end for keeping score, rubber feet to keep everything in place, and a number of options in the companion app, including customizable players and fields, tournament tracking, and the ability to add cheering crowds and other sound effects. While it might not match the resounding "thunk" of a goal scored on a real table, it also won't take up a ton of room in your house.